Evacuated Tube technology coupled with one Wilson tank to suit your dairy farm hot water heater requirements. Wilson Hot Wtaer understand that energy costs increase year on year and that dairy hot water heaters contribute a large portion to the cost of energy in the dairy shed. Therefore Wilson have designed an integrated solar hot water system specifically for the dairy industry. Wilson’s Dairy Solar Hot Water systems use high performance Evacuated Tube technology coupled with one Wilson tank to suit your dairy farm hot water requirements. At Wilson Hot Water, we realised a need for an expertly designed dairy solar hot water system that copes with the rigours of a dairy shed. In most instances it uses one solar preheat tank that saves valuable space and has the reliability of a trusted name in the dairy industry. 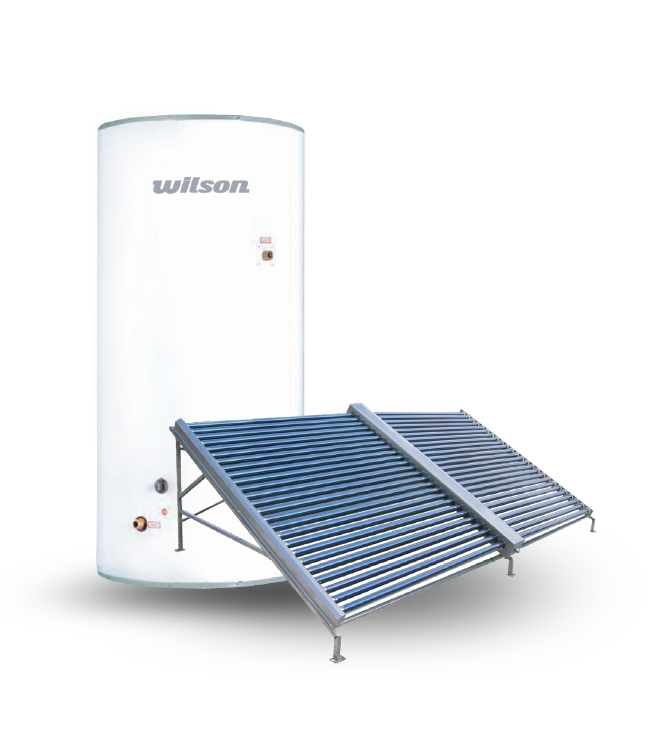 Wilson Hot Water have combined the performance of evacuated solar hot water tubes, the proven performance of a copper pre heat solar tank, a strong circulation pump and solar controller to provide a robust system that is easy to install and maintain.